Fireplace screens: Stay warm in style this winter! The holidays and winter are right around the corner – and that means it’s time to stoke up the fire! We’ve just added some beautiful fireplace screens from Cyan Design. These screens give you high-class style while keeping your family and your home safe from flying sparks. Why does every fireplace need a fireplace screen? A fireplace screen stops sparks from leaping out of your fireplace. These little fireballs are dangerous! Sparks can get into eyes, light clothes or hair on fire, land in your pets’ fur, or set furniture and carpets alight. Bad news! A good fireplace screen offers functional beauty, looking good while stopping the sparks. A fireplace screen is especially important if you’re hosting company and kids – you can’t watch the fireplace all the time, but with a screen you have one less thing to worry about. Blackwell Fire Screen – The fine undulating metalwork beckons you to gaze into the fire. 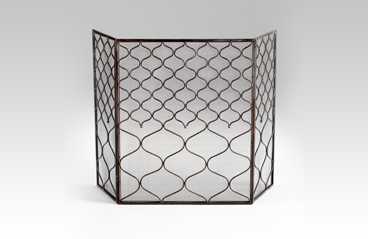 Bronze Fire Screen – A beautiful wrought iron fire screen with bronze accents. Caswell Fire Screen – This fanciful French screen offers regal style that reminds us of a chateau window. The open metalwork of the three firescreens above is backed by a superfine iron screen to stop even the tiniest sparks! It’s hard to get the sliding screen closed all the way. Ours seemed to always have a gap somewhere in the middle, no matter how much we tried to pull it closed. Some built-in screens don’t stop all the sparks. Our built-in screen was a chain-mail style that occasionally let sparks jump right through. A decorative screen looks great when the fire’s out. Instead of having a dark, cold fireplace making a black hole in your living room, a fireplace screen adds interest. A good screen is a conversation starter!